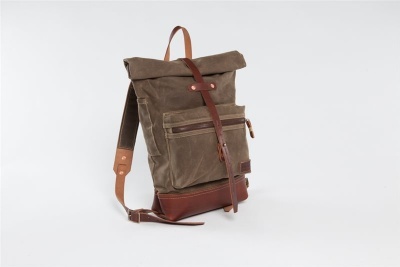 This is a roll top waxed canvas rucksack thoughtfully designed for both the urban and rural adventurer. The straps are all leather & padded with a layer of wool for comfort. It has a baseline buckle connection which allows for more range in adjustability. The double layer of waxed canvas and the roll top closure work together to protect the contents inside from weather. Width 13 at the mouth of the bag tapering down to 10.5 at the leather bottom. *Bradley Mountain leather is dyed organically with oil and wax that may transfer to clothing within the first 2-4 weeks until it sets into the leather. In that time, we recommend wearing dark clothing. Also, color and consistency of leather may vary slightly with each order.